There are three different approaches to washing laundry, ranging from the very meticulous, attentive approach to the just-throw-it-in-the-machine approach, and all the minor variations in between these too. All of them are wrong. Or at least, it is very likely that your personal adopted washing method has included some major flaws which have acted to reduce its effectiveness significantly. That may sound outlandish, but it's true, and here's why. 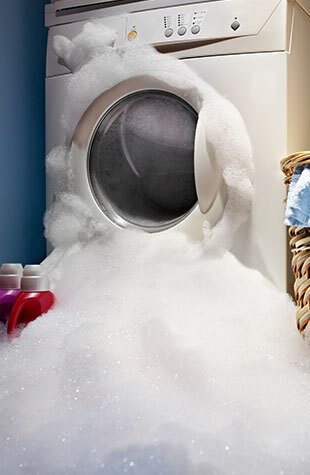 An article appearing in the Wall Street Journal detailed how Americans are typically using way too much detergent in their washing machines, actually leaving clothes dirty and causing problems with their machines. Filling the cap up with detergent is too much by at least half the cap, and the problem has been exacerbated by the fact that in modern times detergent is much more concentrated, and high-efficiency washers use less water to dissolve all that soap. Fabric softeners leave a coating on laundry as they do their softening magic, and while that may smell wonderful, it causes problems with laundry. Towels especially are impacted, because that coating inhibits their ability to absorb moisture. Excess fabric softener also builds up in your wash machine over time, and may eventually begin leaving stains on clothing which can ruin them. Some laundry detergents simply do not dissolve very well in cold water, and this is especially true of powdered detergents. If you're using a cold water setting on your wash machine, it is best to use a detergent specifically made for cold water usage, otherwise you risk having clumps of undissolved powder clotted in your laundry. Most people pay little attention to which laundry items get loaded into the washer first, assuming it makes no difference. Those people who do have a strategy will generally put the dirtiest clothing in first, where it sits at the bottom of the washer. By far the best practice is to load the grimiest laundry last so it sits on top, where detergent can be the most effective.